Task Description: This week I have learnt how to use an algorithm to solve my multiplication problems. In this presentation I have given you the answers and solved it out as well. Here is my learning. Walt:Identify the information that supports the main idea of the text. 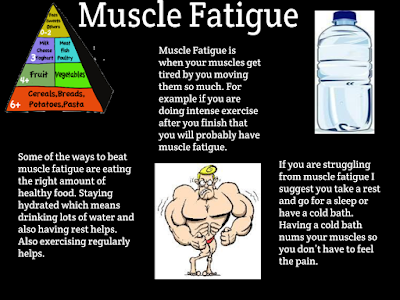 Task Description: Our task was to write down what muscle fatigue is and how we get it. By reading the text I found out a lot about muscle fatigue. Once we filled in all the questions we had to create a poster showing facts about what we learnt.